Nice summary of the benefits, Shai 🙂 Thank you. And Mónika. Thank you, Kevin; and certainly a big thank you goes to Mónika. Thanks for the great article Shai! Incidentally, I use almost exclusively shortcuts, which is one of the worst things about memoQ. A while back, Kilgray told us on the memoQ list: “Sorry, we have run out of shortcuts.” That was the dumbest thing I have ever heard a software developer say. Absolutely EVERYTHING should have its own shortcut, and every action has to be accessible to scripting tools (AutoHotkey, Keyboard Maestro, Applescript, etc.). I have come to more or less accept the ribbon in MS Word. I don’t like it, but I can live with it (with the help of UBitMenu​). For example, I couldn’t find something in MS Word 2013 again yesterday (this time it was the Styles pane), but thankfully I have “UBitMenu​” (http://www.ubit.ch/software/ubitmenu-languages/) installed! This happens all the time. Regarding the ribbon in Windows Explorer: I hate it. Not that I even use Windows Explorer (I use XYplorer, which doesn’t have a ribbon). In any case, I’m happy a few of the smaller CAT tools haven’t given in to what I consider a poorly designed trend. Well, ultimately it is a matter of preference and therefore you can’t satisfy everyone no matter what you’ll choose. I appreciate and respect that some find the ribbon less-than-ideal, and the purpose of this article was not to try and convince someone who thinks differently about the “superiority” of the ribbon, I just expressed my point of view and opinion. The ribbon is definitely not perfect, but what I find to be most important about it is its functionality discovery and workflow supporting qualities. Indeed, experienced users who know the tool’s functionality inside-out have little to gain and much more to loose in the short-term due to the disruption to their workflow habits and ergonomics, but the functionality keeps developing and therefore there is a chance that sooner or later they will be able to benefit from it as well. I also think that the ribbon encourages the use of shortcuts, not least because it makes it easier to navigate the interface using the keyboard when a direct shortcut is not available. I also believe that a lack of keyboard shortcuts is a broader level user experience issue, and not directly tied to the choice of interface design. But in the end this is a matter of personal preference, without a definitive right or wrong answer. It is good that those who like or dislike the ribbon have their choice in software. I suppose only time will tell if one of the roads taken at the Ribbon/No ribbon fork was better, or if they were perhaps both good in their own ways. I honestly don’t believe there is right or wrong here. The interface is just one component of the user experience and doesn’t necessarily equate it. Both the old toolbar-centric and the ribbon interfaces offer satisfactory (but not perfect) options to get them out of the way or make them central as one likes, and most of the differences are quite marginal I think. The biggest impact in my opinion is the change in how the interfaces affect the user experience in terms of learning the functionality and developing the workflow, and this is the main benefit I find in the ribbon over the conventional toolbars and menus. However, more time and independent usability studies are needed to measure this effect and determine if the transition was mostly cosmetic, or really succeeded in promoting a different usability approach. Transit NXT was released in April 2009, it brought the Ribbon (and many other innovations) and many users of other CAT tools argued that Transit’s interface was too crowded. 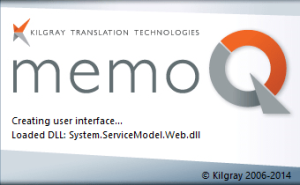 Five and a half year later memoQ introduces the ribbon too. The times, they are changin’ ;). Thank you for your comment, Hans. The first reaction to most changes is usually skepticism, even unfounded criticism. Early adopters suffer for it the most. This is even when the change has some merit and benefit to it. On the other hand, there are also changes forced on the users who for the most part learn to live with them, creating the illusion that the change was positively received. I think the ribbon falls into the former group of changes, but there are enough people that will argue that the latter is true. MemoQ is really helpful software.